Often thought of as the jewel in North Africa's crown, Egypt is a popular destination for history buffs, nature lovers and adventure seekers. It is home to some of the world's most iconic sights, including the Great Pyramid at Giza, the only surviving member of the Seven Wonders of the Ancient World. To get the most out of your visit, brush up on your knowledge of the country's geography and history before you go. Egypt occupies the northeast corner of North Africa. It shares borders with Libya to the west, the Sudan to the south and the Mediterranean Sea to the north. To the east the country borders the Red Sea and is separated from the Egyptian Sinai Peninsula by the Suez Canal. The Sinai Peninsula shares borders with Israel and the Gaza Strip. Egypt has a total landmass of 618,544 miles/995,450 kilometers, making it more than eight times the size of Ohio, and more than three times the size of New Mexico. It is a hot, dry country, with an arid desert climate that results in scorching summers and moderate winters. Egypt's lowest point is the Qattara Depression, a sinkhole with a depth of -436 feet/-133 meters, while its highest elevation is the 8,625 foot/2,629 meter summit of Mount Catherine. 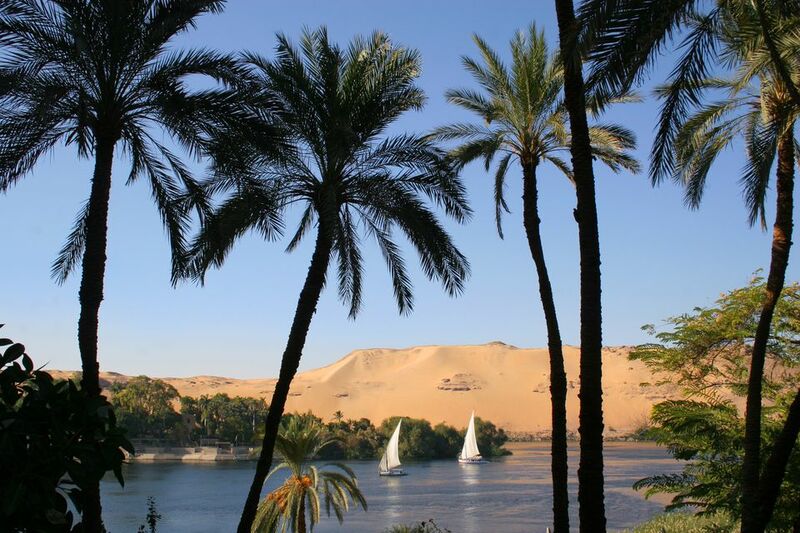 The country's primary water source is the River Nile. Flowing northwards through 11 African countries, the Nile measures 4,358 miles/6,853 kilometers in length and is considered the longest river in the world. In Egypt, the fertile Nile Delta is responsible for most of the country's agricultural output. In the far south lies Lake Nasser, one of the planet's largest man-made lakes. It has a total surface area of 2,030 square miles/5,357 square kilometers and was created by flooding caused by the construction of the Aswan Dam. To the northeast of the country lies the Sinai Peninsula, a triangular stretch of desert that bridges the divide between North Africa and Southwest Asia. Egypt also controls the Suez Canal, which forms a sea link between the Mediterranean Sea and the Red Sea, allowing onwards passage into the Indian Ocean. Egypt's size, strategic location and proximity to Israel and the Gaza Strip put the nation at the forefront of Middle Eastern geopolitics. Evidence of human habitation in Egypt dates back to the tenth millennium BC. Ancient Egypt became a unified kingdom in approximately 3,150 BC and was ruled by a series of successive dynasties for almost 3,000 years. This period of pyramids and pharaohs was defined by its remarkable culture, with major advances in the areas of religion, arts, architecture and language. Egypt’s cultural richness was underpinned by an incredible wealth, founded on the agriculture and trade facilitated by the fertility of the Nile Valley. From 669 BC onwards, the dynasties of the Old and New Kingdoms crumbled under an onslaught of foreign invasions. Egypt was conquered in turn by the Mesopotamians, the Persians, and in 332 BC, by Alexander the Great of Macedonia. The country remained part of the Macedonian empire until 31 BC, when it came under Roman rule. By the 4th century AD, the spread of Christianity throughout the Roman Empire had led to the replacement of traditional Egyptian religion - until Muslim Arabs conquered the country in 642 AD. Arab rulers continued to govern Egypt until it was absorbed into the Ottoman Empire in 1517. There followed a time of weakening economy, plague and famine, which in turn paved the way for three centuries of conflict over control of the country - including a briefly successful invasion by Napoleonic France. Napoleon was forced to leave Egypt by the British and the Ottoman Turks, creating a vacuum that allowed Ottoman Albanian commander Muhammad Ali Pasha to establish a dynasty in Egypt that lasted until 1952. In 1869, the Suez Canal was completed after ten years of construction. The project nearly bankrupted Egypt, and the extent of the debts owed to European countries opened the door for a British takeover in 1882. In 1914, Egypt was established as a British protectorate. Eight years later, the country regained independence under King Fuad I; however, political and religious conflict in the Middle East in the wake of World War Two led to a military coup in 1952, and the subsequent establishment of the Egyptian republic. Since the 1952 revolution, Egypt has experienced a time of economic, religious and political turmoil. In 2011, dictatorial president Hosni Mubarak was forced to resign after 30 years in power by a series of labor strikes and violent protests that ultimately resulted in the government being handed over to the Egyptian military. In 2012, Muslim Brotherhood parliamentarian Mohammed Morsi won the presidential election, but his rule was short-lived; in 2013, he was ousted by the army after further conflict between the government and anti-Muslim Brotherhood protestors. A new constitution was approved in early 2014, and soon afterwards current president Abdel Fattah El-Sisi was elected. Since then, Egypt's political situation has stabilized, although the country has suffered a spate of terrorist attacks carried out by groups like Daesh-Sinai (formerly known as ISIL or ISIS). The most recent of these include an incident in which gunmen attacked a bus of Coptic Christians, killing 30 people in May 2017; and in November 2017, 300 civilians were killed while worshipping at a North Sinai mosque. As a result of increased terrorism activity and political instability, tourism reached an all-time low in 2015 but has begun to recover in the last three years. UK and US travel warnings consider most of Egypt's popular tourist destinations to be safe - but it's still worth checking for the latest updates before booking your trip.